Did you know you can now order your Deliveroo takeaway from Boisdale of Bishopsgate here on View? By sending this booking your details will only be sent to Boisdale of Bishopsgate and will never be shared with other third parties. By clicking this box you agree to the Terms and Conditions set out above. You can book to reserve an area of Boisdale of Bishopsgate for you and your friends. Just enter your requirements below to see what they have to offer. What did you think of Boisdale of Bishopsgate? 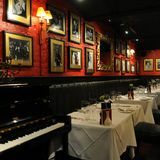 Boisdale - classic Brit cuisine though very north of border with it's neeps and tatties emphasis. Haggis and other Jock grub make Boisdale a place to go for anything you can wash down with Scotch. This appealing old-timer might just be the only place in London where you can order haggis on toast with a dram of 21-year-old Glenlivet. 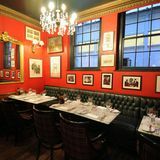 The second of three Boisdale restaurants might not be the coolest kid on the block, but it holds a certain old-fashioned charm. First impressions non-withstanding (the entrance is down an alley beside Dirty Dicks), the restaurant is smart and surprisingly un-fusty, despite an abundance of tartan carpet, marble busts and white tablecloths. 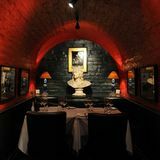 A champagne and whisky bar takes up the ground floor, while the restaurant lies in the red-walled, candle-lit cavern beneath. It’s a little clammy, as basements are wont to be, but live music creates an intimate atmosphere. There are nightly singers and piano sets here; their patron, Jules Holland, plays eight or so gigs a year in their 250-cover Canary Wharf behemoth. 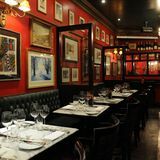 Bishopsgate’s Boisdale might not have been around as long as their 25-year-old Belgravia branch, but service is still from a bygone age. Erudite waiters show flashes of oft forgotten silver service, carefully aligning each monogrammed plate and topping up wine unprompted. They’re unabashed to have a solid clientele of an older age group, but those in their twenties or thirties shouldn’t dismiss a meal here; once cosseted into a cosy corner, it can feel quite romantic. Beyond the splashes of tartan, Boisedale’s Scottish origins are chiefly evident in the menu. Oysters, smoked salmon, caviar and steak are their mainstays. 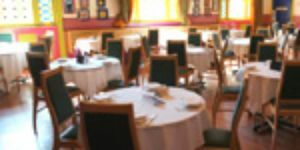 At just under £20 for two courses their “Jacobite 1975” menu offers superb value, while a la carte dishes are priced pretty fairly for the ingredients. Beef is particularly well sourced, with even the starter rump steak a 35-day dry aged Dexter rare breed. Deviating from their classics, a bowl of heirloom tomato gazpacho (£8.50) is a little thin, but delivers a spicy kick. Accompanying egg, shallot, caper and anchovy toasts provide extra pep. A more conventional crab cocktail (£11.25) is pretty faultless: the addition of samphire, chilli and coriander keeping it contemporary. Rare breed Jacob lamb rump (£250) comes daringly rare with a clever nettle pesto, artichokes and San Marzano tomatoes. Only some rather salty sundried tomatoes detract from what’s otherwise a well balanced and well presented combination. Equally good is a lip-staining squid ink risotto topped with crispy squid and girolles (£17.50), a rare example of an original risotto dish. Desserts tend towards the classic. Banoffee cheesecake (£7) comes with an accomplished poppy seed tuille and salted rum caramel, while homemade white peach ice cream (£6.50) also shows skill in the pastry section. 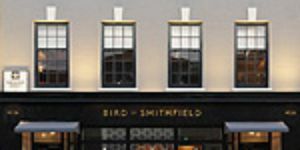 There’s a suitably pricy selection of champagnes and fine French wines to whet your whistle, ranging from the Boisdale Claret to magnums of 2001 Margaux. Those looking to impress might want to splash out a bemusingly precise £1367.80 on a glass of 1946 Macallan whisky – best enjoyed with a cigar, of course. For a sensible £18.90 a bottle, the Vin de Pays de l’Aude Symposium Blanc is perfect fodder for those who think Chardonnay is all oak and butter: blended with Chasan, it’s light, crisp and peachy. Boisdale might be peddling a rather old-fashioned style of dining, but somewhere between Spitalfields and SushiSamba, it’s oddly quite refreshing.